The 2013 Community Games were held all over the country to celebrate the cultural and sporting activities in local communities a year on from the London 2012 Olympics. Burwell’s contribution was held on Saturday 13th July at Burwell Sports Centre when around 150 residents came to take part in some of the best sporting and leisure activities on offer in Burwell, both at the Centre and elsewhere. 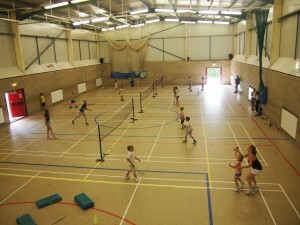 Many of the Sports Centre’s regular activities were showcased, including Jazzercise, Jane Newbury’s School of Dance, Le Club Francais, Friday Night Circuits, Mature & Active Classes, badminton and table tennis. The Astroturf hosted various football activities throughout the day allowing children and adults of all ages to take part in matches, a penalty competition and a crossbar challenge, as well as introducing Futsal, a 5-a-side, indoor, fast action version of the traditional game. Burwell Karate came along to show us their skills. Staff from Burwell Library lead a story time session and introduced children to the ‘Creepy House’ Summer Reading Challenge. Participants were also given the chance to give some new sports a go, including volleyball and kwik cricket. 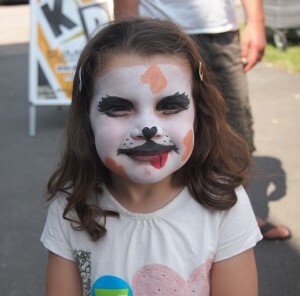 The face painting proved very popular as you can see. A Batak Pro reaction challenge drew a lot of competitors to test their reaction times. Many thanks to Paul Warren for supplying this for the day. Lastly, many thanks to the Estall family for manning the BBQ for us.